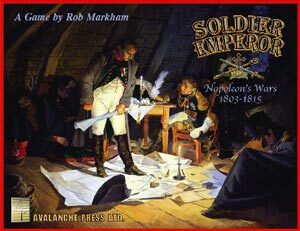 Taking Soldier Kings as its base, Soldier Emperor covers the Napoleonic Wars in Europe, 1803-1815. There are 180 huge and thick playing pieces like those in Granada, 165 smaller marker pieces, two large hard-mounted game boards like that in Granada, and 64 cards. The map stretches from Britain to Persia, North Africa to Norway. Europe is divided into areas, each of them rated for their resources, manpower potential, and defense value. Armies move along the routes that connect these areas, and the object of the game is to conquer and hold as much territory as you can. Soldier Emperor is very true to history but is easily playable by anyone with an interest in games or history. This is probably the first time that Persia has appeared in a Napoleonic wargame, but the Persians fought the Russians twice in this period and also threatened war with the Turks. They receive two armies, plus their fine leader, Crown Prince Abbas Mirza. Turkey's eastern border regions are shown as well: Kurdistan and Baghdad appear. Unlike other games, the Turkish player can't operate with a secure right flank but must worry about his or her "back door." The Turks begin with rather mediocre leadership, Ebubekir and Bayrakdar on land and Seyit Ali on the sea. But once Sultan Selim is overthrown (an event brought about by card play), Turkish leadership improves as junior generals are promoted. The Turks also can deploy the Banner of the Prophet, using Mohammed's ancient flag to inspire their troops. Prussia is small and relatively weak, but does have two fair generals (Yorck and BlÃ¼cher) and a good army. But if the army is lost in action Prussia's low resources and manpower will make the losses difficult to replace. France of course has Napoleon, some other very good generals, and the largest army in the game. The French player also has the Imperial Guard. France has a powerful economy and strong starting position â€“ and a large target painted right on the French player's back. France's revolutionary ways bring its player a number of game advantages (in movement and battle) and some disadvantages as well (in diplomacy, at least until France's enemies have been beaten into submission). Britain has the expected advantages: large income from overseas trade, a powerful fleet, and Lord Nelson. They also have a couple of lesser admirals (Collingwood and Jervis) and the outstanding Duke of Wellington to lead the land forces. But the army is small, and hard to replace if lost. Spain can call out guerrillas if invaded, and will need every advantage to offset its weak economy, poor generalship and second-rate army. The fleet is good, and Gravina is a good admiral. Spain also has access to several minor countries that others can't easily reach, and a starting position in Italy that can allow for quick expansion (Etruria, held by a Spanish prince in 1803). Russia, the final player-controlled country, has a vast land area, a strong position on the edge of the board, and a large and strong army. Leadership is good, with Kutusov and Kamensky the best of the lot plus Senyavin to command the fleet. But as in Soldier Kings, the Russian player will be chronically short of cash and willing to do many things to change this. As in Soldier Kings, the game can be played with fewer than seven players, all the way down to two. Card play drives the action, with players able to play cards at any time and thwart their opponents' plans. Play order is determined by each country's initiative, and generals and admirals move their forces from area to area. And like Soldier Kings, combat is simple to resolve but contains many wrinkles of strategy. From 1803 until 1815, war raged across Europe as Napoleon Bonaparte sought to establish French dominance. Fighting went on for a dozen years before the Allies finally broke French power. Solder Emperor is an exciting game for two to seven players, who take the role of the rulers of France, Austria, Spain, Turkey, Britain, Russia or Prussia. The object of the game is to conquer rich lands for your empire, and stop your rivals from doing the same. Each player has armies, fleets and leaders to help accomplish this. But mostly, winning depends on the skill and guile of each Soldier Emperor.